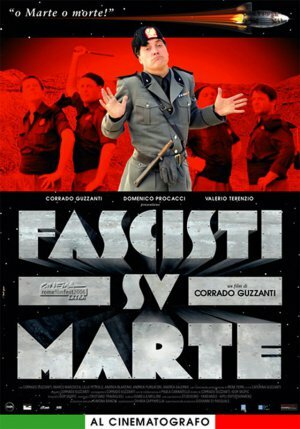 A series of newsreels from a twenty-year period, miraculously rescued from censorship by the prevailing Marxist historiography, bring back to light an extraordinary event that pays homage and gives lustre to the Mussolini era and to all of Italy – the conquest and subsequent colonisation of the planet Mars by an indomitable fascist team in 1939. Lacking diving suits, respirators and other useless modern frills, the Fascists, armed only with fascist will and categorical requirements, tenaciously continue the undertaking to give Rome and its Duce a new, more prestigious ‘place in the sun’. The result is a visionary film, rich in graphics and backdated effects, halfway between a Flash Gordon and a (false) historical documentary, that tells the story of a parallel, science fiction fascism and allegorically plays with Italy’s present and non present, with the greened language of the cold war, nationalism, racial and religious intolerance, the fragility of the democratic spirit that dominated the Italian political debate during the years of the second republic.